The death of Toys “R” Us was a huge blow to toy companies and cartoon giraffe enthusiasts, but some toy-industry experts think there might be a new frontier for sales: the supermarket. 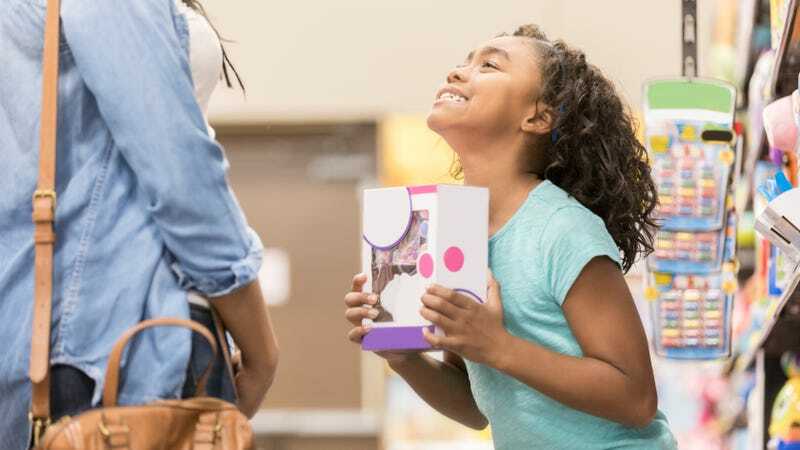 Consumers already consider grocery stores a one-stop shop for toiletries, flowers, and even the pharmacy—why not add toys? Oh right, because parents would lose their damn minds. The Washington Post has a nuanced look into the toy industry debate over whether supermarket shelves are a logical place for toys. On one hand, supermarket chains represent a huge opportunity to get toys into retail spaces. On the other hand, tired parents can already hardly contain the sheer amount of crap their kids want to throw in the shopping cart; adding toys to the mix might be the final straw in pushing families toward online grocery shopping. “Being annoyed by toys is going to turn parents off,” supermarket analyst David J. Livingston tells The Washington Post. He says some parents already don’t bring young kids to the supermarket to avoid the chaos and distraction while a parent is trying to shop. But other voices in the toy industry think grocery aisles are a logical place for toys. Picture swim toys next to sunscreen, suggests Tim Hall, CEO of the analytics startup Simporter and a former Hasbro executive. As a kid who was imprisoned in the shopping cart’s metal confines lest I fill our cart entirely with Gushers and Lucky Charms, I can say with absolute certainty that the 6-year-old version of me would have grabbed every toy in sight. My brother and I were dazzled by the impulse buys in the checkout lane, begged for balloons for sale at the register, and wanted quarters to put in the toy machines on the way out, too. Throw Tamagotchis on the shelves and our mother might have just resorted to child leashes.